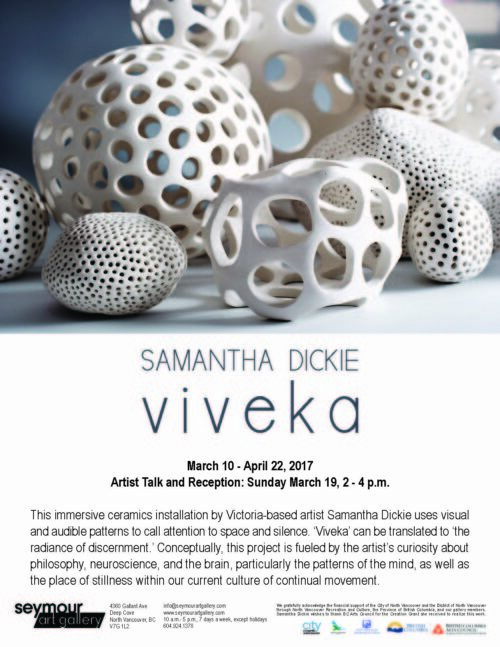 Viveka Exhibition at Seymour Public Art Gallery from Samantha Dickie on Vimeo. Seymour Art Gallery, a public gallery in Deep Cove, North Vancouver, invited me to exhibit a new project in conjunction with presenting at the Canadian Clay Symposium. Along with the 6 week exhibition, there’s been an artist talk, reception, and multiple school tours and events at the gallery. Huge thanks to Sarah Cavanaugh, curator, and Vanessa Black, gallery assistant for their unending support. Thank you to BC Arts Council for funding this project through a creation grant.